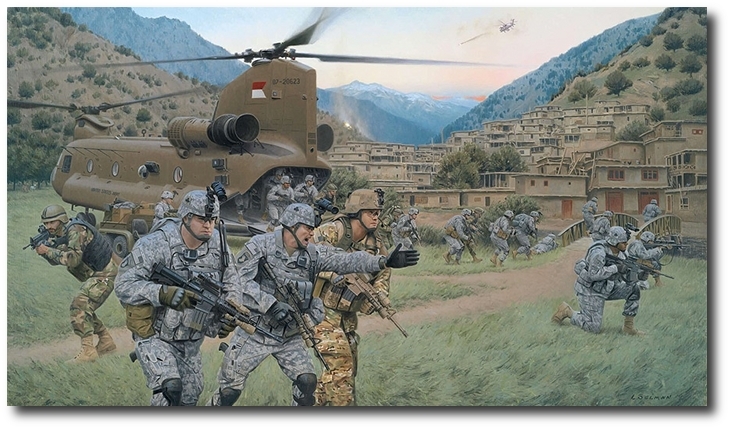 Overall size: 32 1/4" x 22 1/8"
Image size: 27 3/4" x 15 7/8"
Task Force Bastogne conducted operations in the turbulent Afghan provinces of Nangarhar, Kunar, Nuristan and Laghman. TF Bastogne�s oversight of these provinces commenced on June 1, 2010 when it relieved TF Mountain Warrior. TF Bastogne served in this eastern theater of Afghanistan until relieved by TF Bronco. Throughout many remote valleys of the most highly kinetic terrain within all of Afghanistan, TF Bastogne wrote a new chapter worthy of the valorous history of the 101st Airborne Division. Together with their Afghan allies, TF Bastogne Warriors braved many perilous air assault missions into forbidding regions including Barge-e-Matal in Nuristan, the Pech, Korengal, Marawarah, Ghaziabad, Dangam and Watapour Valley of Kunar, the Ali Shang Valley of Laghman, the base of the Tora Bora Mountains in Nangarhar, as well as numerous other treacherous domains. The extreme hardships and human costs were sometimes gut-wrenching, but TF Bastogne Warriors were resolute and always met the difficult challenges with courage and honor. The enemy suffered grievous losses as a result. And through close combined action and most importantly, example, the Warriors of TF Bastogne further developed their Afghan allies into a more formidable security forces. TF Bastogne set the stage for success in CJTF-101�s RC-East, and facilitated Afghanistan�s transition towards a stable and legitimate member of the world community. With this commemorative print, we honor our many Task Force Bastogne fallen heroes who gave their all, making this mission a success.